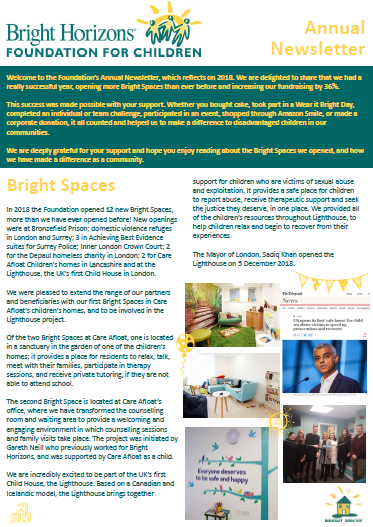 Bright Spaces are warm, safe, enriching play environments for vulnerable children affected by abuse, domestic violence, parental imprisonment and ill-health. Complex trauma experienced in childhood can have a lifelong damaging impact on children’s physical, emotional, and intellectual development. Our 67 Bright Spaces in the UK benefit thousands of children, providing them with a safe place to learn, have fun, build positive relationships and heal from trauma. Our experienced volunteers create Bright Spaces which respond to the needs of our partners and the children and families we collectively support. What’s New is the place to discover all the latest news about the Bright Space programme. Read on for the most recent stories. Our purpose is to make a difference in the communities where we live and work. Read this section to learn more. Our Bright Space design is trauma-informed. Children experiencing crisis and disadvantage have different needs to children who are not. Find useful resources in this section. Children in crisis need our help. Bright Spaces provide these children with a safe place to play, learn, have fun and build positive relationships.